The UBC Collab theme provides a frontpage template with custom frontpage elements, making it to achieve the common frontpage layouts seen around UBC. The frontpage consists of three main elements - the feature slider, the frontpage widget area, and the content area. 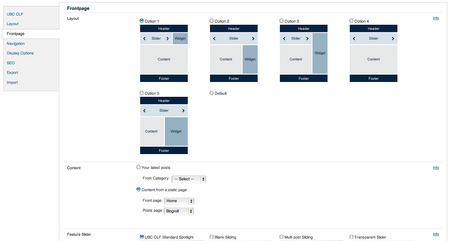 To configure your site's frontpage, go to Dashboard > Appearance > Theme Options > Frontpage. PLEASE NOTE: You can use an existing page that you've already created as your frontpage. To find out how to do this, please see the upcoming content section. The Frontpage tab has three sections of options: the layout, the content, and the feature slider. The Layout section lets you control how the three elements of the frontpage - the feature slider, the frontpage widget area, and the content area - will be laid out. Each different layout changes and rearranges where the widget area is placed, as well as the width of the feature slider. Pick one of the options for your frontpage. If you don't want to use the custom frontpage elements, select the "Default" option. This will disable the feature slider and the frontpage widget area. The Content section allows you to control what to display in the content area of the frontpage. You can choose to display either the latest posts or content from a static page in the content area of the frontpage. If you choose to display content form a static page, please know that you will change the already existing page as the front page and you can also designate an already existing page to display the latest posts or leave it blank. To select an already existing page as the frontpage, you will need to click on the "Content from a static page" option and choose the page from the "Front page" dropdown menu as the frontpage. The Feature Slider options control the slider area of the frontpage. Start by specifying the category of posts you wish to see in your slider. Generally, it is a good idea to create a category like Featured or Spotlight. This makes it easy to identify posts which you want to feature on your spotlight. Other options in this section let you control the look and feel of the feature slider, as well as details such as the number of slides, the slider image size height, and enabling a "read more" button. To emulate the tabbed sidebar look seen on UBC.ca's right sidebar, use the "Tabbed Section Widget" by placing it in the Frontpage Widget Area. This is done under Dashboard > Appearance > Widgets.